The Earl and Countess of Wessex – Prince Edward and Sophie - are visiting the Gibraltar from Monday to Wednesday (11-13, June) as part of Her Majesty the Queen’s Diamond Jubilee celebrations. will visit Gibraltar, on behalf of Her Majesty The Queen, in celebration of the Diamond Jubilee. Trustee, will present Awards to young people who have achieved the Gold Standard in The Duke of Edinburgh's Award, in Gibraltar. will visit the offices and staff at GibDock, Gibraltar. will attend a Reception at King's Bastion Terrace, Gibraltar. will attend a Dinner at the Rock Hotel, Gibraltar. will attend a Ceremonial Welcome on arrival in Gibraltar. President, Girlguiding UK, will visit the Girl Guides Headquarters, Alameda House, Gibraltar. will visit Seafarers Centre (Flying Angel Club), Gibraltar. will visit the Port Authority and Vessel Traffic Control, Gibraltar. will inaugurate a memorial plaque for Moroccan Workers on a fountain in Alameda Gardens, Gibraltar. will visit Gibraltar Museum, Gibraltar. will meet Veterans from Her Majesty The Queen's Royal Visit in 1954, at a lookout on the Rock, Gibraltar. will visit the Stay Behind Cave, the Rock, Gibraltar. will visit St. Martin's School, Gibraltar. will meet Members of Her Majesty's Armed Forces at The Tower, Navy Base, Gibraltar. will attend a Jubilee Regatta and present the Wessex Prize Awards at the Rowing Clubs' Boat House, Gibraltar. will open the Children's Playground at the Morrish Castle Estate, Gibraltar. will visit King's Chapel, Gibraltar. will meet Religious Leaders at the Convent Cloisters, Gibraltar. will open the new Court building and tour the Magistrates Courts, Gibraltar. will visit Laguna Social Club, Laguna Estate, Gibraltar. will visit the new Viewing Terrace and Airport Terminal Building, Gibraltar. will attend a Diamond Jubilee Song and Dance Road Show, John Mackintosh Square, Gibraltar. 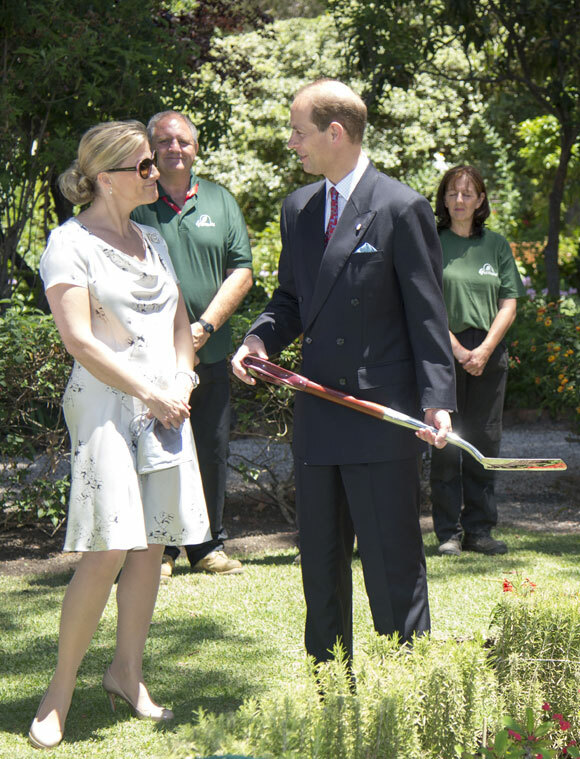 will plant an oak tree in celebration of the Diamond Jubilee in the Governor's Residence, Gibraltar. will lay the foundation stone for the Diamond Jubilee Monument at the Jubilee Commonwealth Park, Gibraltar. A some people wonder if the Royals work? The schedule must be exhausting. This is some schedule, and it's only a three-day-long trip. I agree; these people work, and work pretty darn hard. A busy schedule for the Wessexes in Gibraltar over the next few days. I'm so glad that the Gibraltarians, who are among the Queen's most loyal subjects, are getting a royal visit this year. Let's hope the Queen herself can make a visit there next year to celebrate 300 years of British sovereignty on the Rock. All this negative press over their visit, if i were them, would make me unsure as to whether i wanted to go! I understand Spain's issue, but it is not something that is going to be changed by negativity toward Britain, particularly their royal family. I have no doubt that Spain will one day own Gibraltar, but for now can't they just let the Queen celebrate 60 good years. Let's hope that with all this press there will be many photo opportunities for Edward and Sophie. If I were a royal, Gibraltar would be right at the top of the list of places I would want to visit. The Gibraltarians always give the royals a hugely warm welcome, and are genuinely thrilled to receive any member of the family. To put it bluntly, Edward and Sophie don't generally generate big crowds on their visits; this will be an exception. I'm sure they'll enjoy it. The Earl and Countess of Wessex have touched down in Gibraltar. Prince Edward and the Countess of Wessex looked relaxed as they stepped off a British Airways plane in front of the Rock of Gibraltar today. Their trip has already been roundly attacked by the Spanish government, which is said to be 'displeased' at their patronage of the former colony. But the Queen's youngest son and wife Sophie Rhys-Jones seemed to be enjoying the regal affair as they arrived in sunny Gibraltar to join in the Diamond Jubilee celebrations for Her Majesty. As the Earl and Countess of Wessex approached through a sea of people lining Gibraltar's Main Street, she beamed at them and croaked: "Thank you for coming, it means so much to us." IMG_3933 | Flickr - Photo Sharing! Visit by the Earl and Countess of Wessex to Gibraltar | Flickr - Photo Sharing! Vist to Gibraltar by the Earl & Countess of Wessex to Gibraltar | Flickr - Photo Sharing! I love the picture you selected Mag, Sophie looks really smug. I would love to see a video as I want to know what they are saying yo each other. Thank you for so many links to images, I like the second dress Sophie wore. Some lovely moments from the couple. the sophie's photo witf the baby is sooooooooooo adorable!